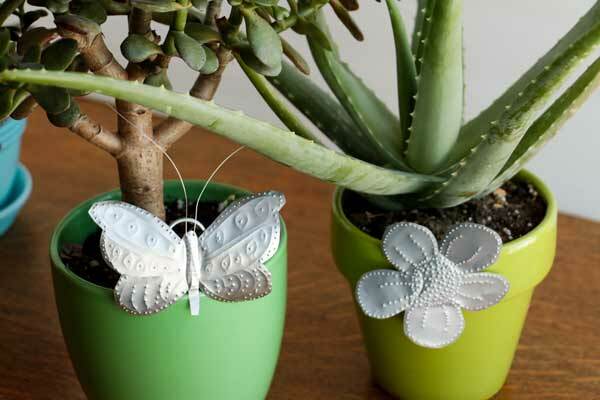 Turn soda pop cans into decorative charms! 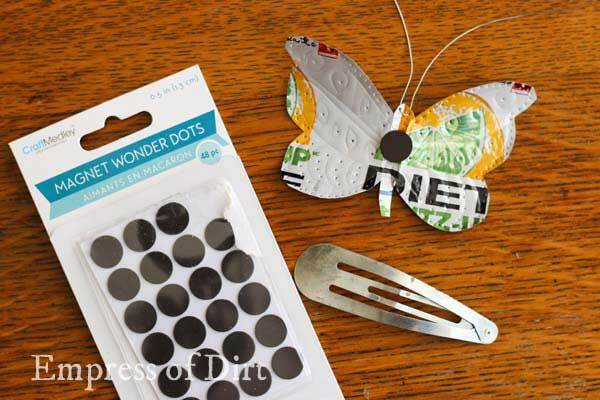 This simple craft usues the metal from pop cans to create punched tin butterflies, flowers, birds, and more. 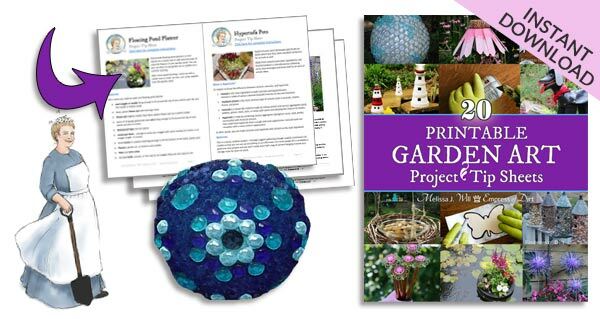 Also see these recycled garden art projects for more ideas. This world has one major garbage problem! All the single-use packaging is piling up, filling landfills, and blowing into our oceans and streams. Mayday, mayday! The volumes are truly overwhelming. No, this craft is not going to solve the problem. But certainly, giving materials second lives can help slow down the process while we sound the alarm. Ultimately, we need to just stop. If I was Empress of the World, I’d order product packaging—if it’s even necessary—to be reusable and shared, so all makers of the same item use the same container. No oversized, deceptive boxes and plastic wrap. Just what’s needed to transport the item safely. And if you’re going to produce it, you have to be responsible for it from cradle to grave. Not just until it hits the store shelves. Bam! And, and, I could go on and on. We need an even, regulated playing field. Rant over. 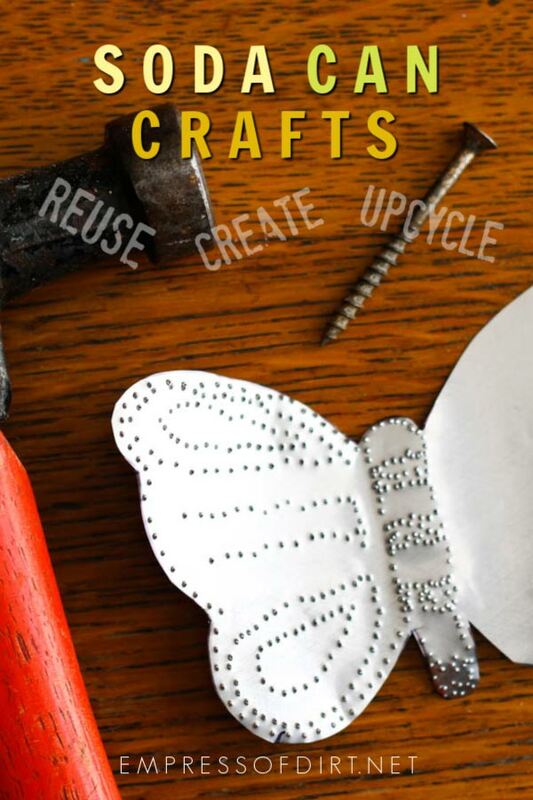 Let’s craft. 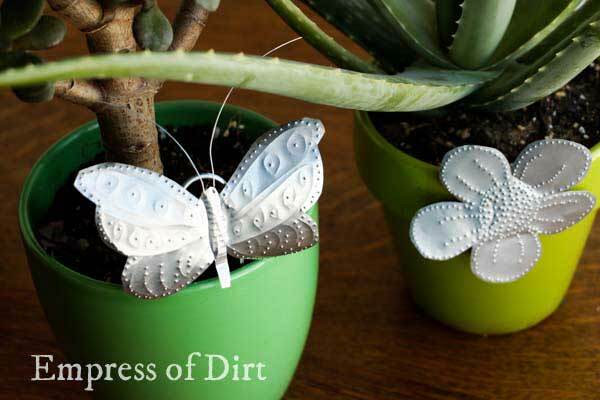 I call these ‘garden charms’ but you could make anything with a simple shape. 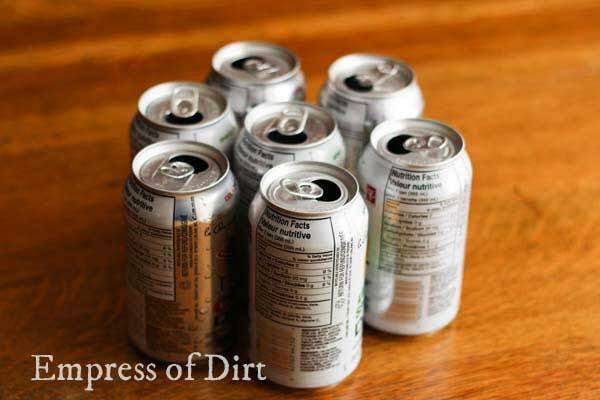 Wash rinse and dry the soda cans. Cut off bottom and top with box cutter. You’ll end up with a rectangle of metal. To flatten it out, roll it over a table edge, removing the curl. 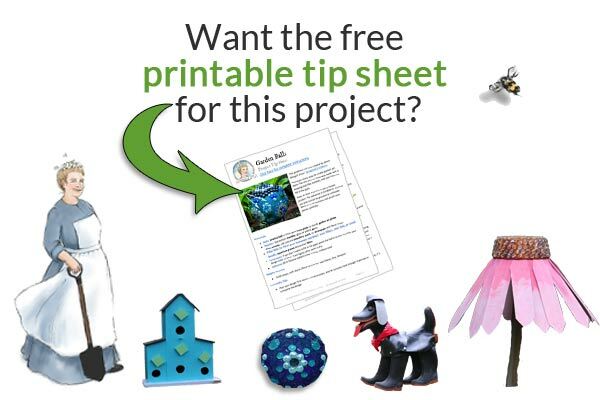 Create templates with cardstock. 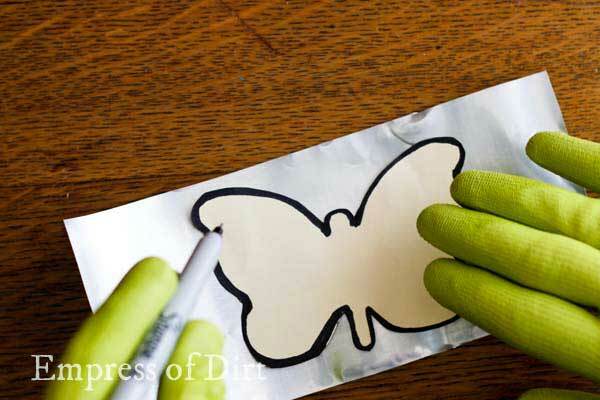 Ideas include butterflies, flowers, birds, or any basic shapes. Make sure your design fits the size of the metal. I made snails, butterflies, birds, and flowers. 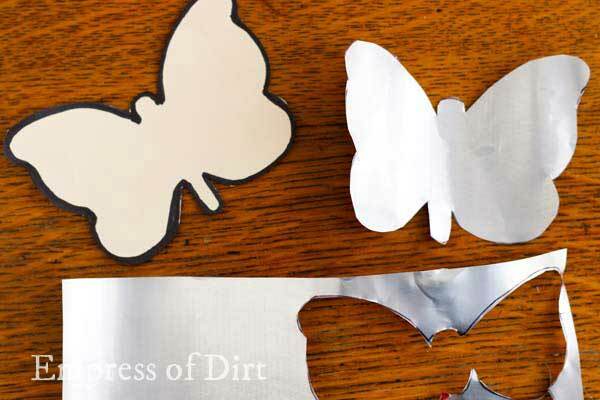 Trace the template onto the metal and cut out. 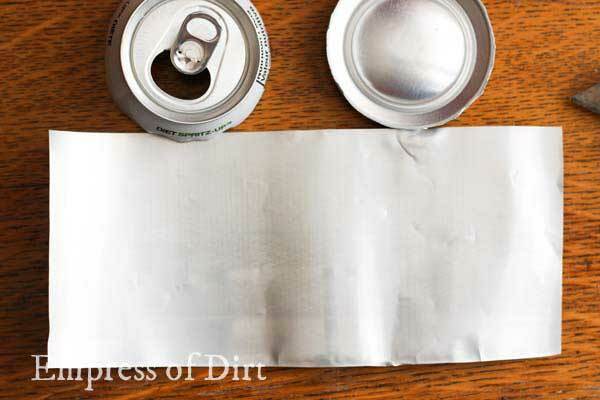 If your soda can metal is the same as mine, I find that only pointed corners are sharp. The round cuts are smooth. If you’re worried about the charm being sharp to touch, just stick to round shapes. This is the fun part. 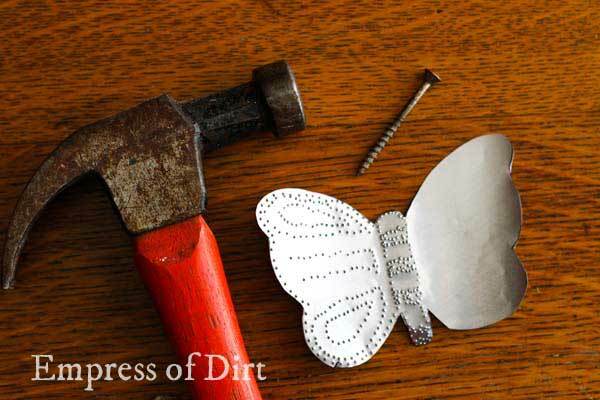 Place the butterfly on an old cutting board and punch designs in it with a screw/nail and hammer. If you need to draw lines to follow, pencil shows up lightly. 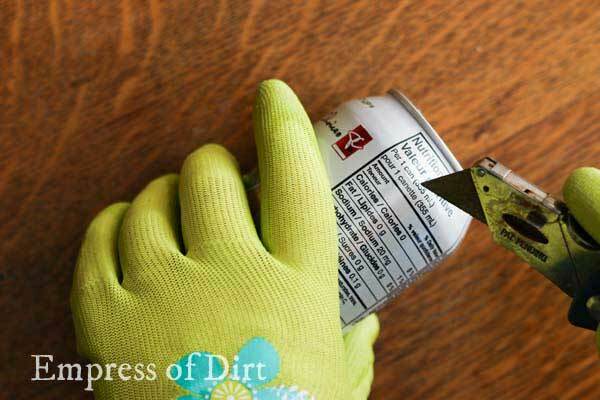 You can also use a fine sharpie marker and remove the marks later with acetone nail polish remover. 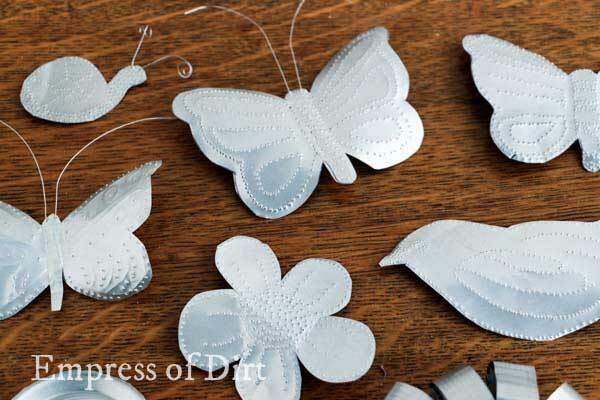 For something like a butterfly, try to make your nail punch designs symmetrical. Here (next photo) you can see the back side of the butterfly. I’ve threaded a fine piece of wire through holes at the top of the head to look like antennae. I attached a magnet with hot glue so the charm will stick to magnetic surfaces. 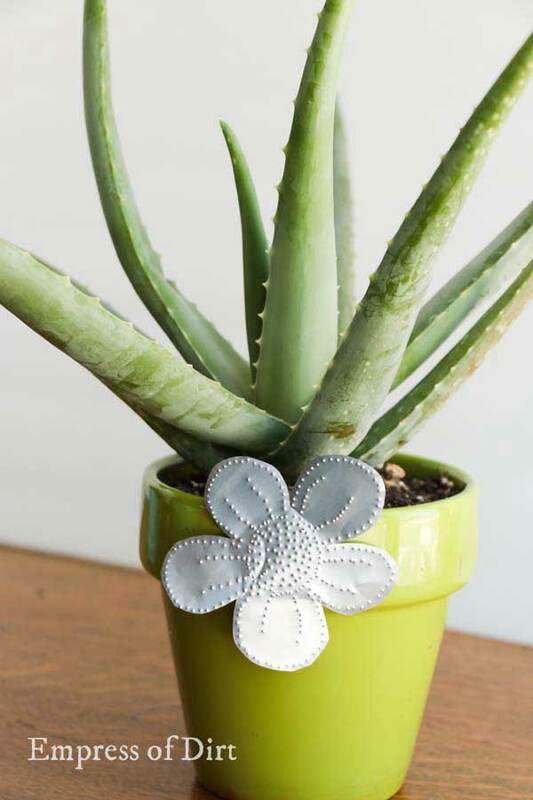 To display them on plants, I attached the charms to simple metal plant markers. And we’ve solved the garbage problem and the world lives happily ever after! Woot! Okay. Not. But, happy crafting.